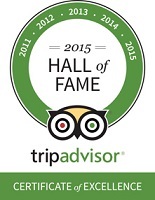 Room rates vary with discounted rates as low as $136 USD per night. Beautifully integrated amid towering native palms within an ecological preserve, Hacienda de la Costa in Sayulita is an adults-only secluded haven. Located just two miles from the vibrant oceanside village of Sayulita, Hacienda de la Costa enjoys the privacy of an exclusive estate while the attractions of pueblo life in Sayulita such as restaurants, shopping, and activities are within easy reach. 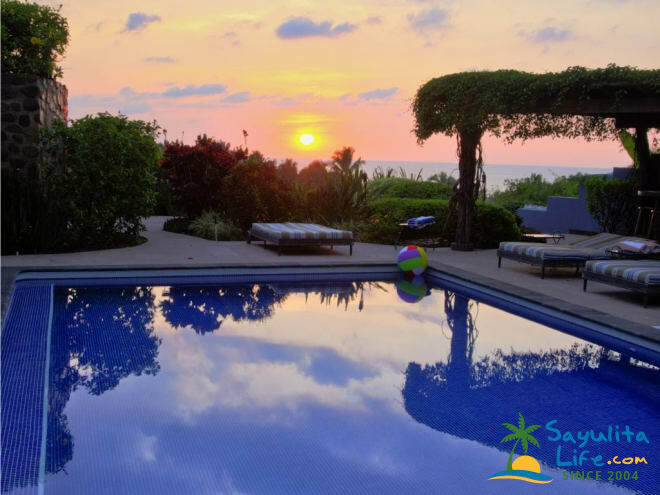 The privileged natural setting boasts numerous sandy beaches perfect for making unforgettable Sayulita vacation memories. With just 5 spacious suites, each containing 1 bedroom and 1 bath, the property accommodates a maximum of 10 guests, tranquility is assured. Every aspect of these accommodations has been designed with your privacy and comfort in mind. The combination of modern amenities with artistic elements reminiscent of old world Mexico makes this the perfect escape for relaxing in the tropics on your Sayulita vacation. Complimentary breakfast served poolside with a different entrée each morning in addition to the daily selection of fresh fruit, cereal, yogurt, juice and coffee. Hacienda de la Costa is the perfect choice for discerning guests who wish to enjoy the vibrance of the seaside village of Sayulita, yet wish to stay in a quiet and secluded setting with ocean views, beaches and the magnificent jungle. Hacienda de la Costa is an adults only B&B and is the perfect setting in which to enjoy your Sayulita vacation. Please use the Contact Information form to email us, and we look forward to your visit. We enjoyed our fourth stay at Hacienda de la Costa (HDLC) in early March. We keep returning because this is a little piece of paradise. The daily breakfast is better than anything you'll find elsewhere and always perfectly prepared and presented. We adore the premises, have been privileged to get to know Steve and Terri over several years, and have a treasure trove of good memories from our visits to HDLC. The peace and quiet, bird watching, glimpses of whales and dolphins off-shore, and serenity of HDLC make for a soothing vacation. The pool is actually heated, unlike most you'll find, with solar panels discreetly tucked away nearby, ensuring that it is always comfortable yet refreshing. Steve and Terri will help with advice, arrangements and directions, but will also leave you to your own devices if you know what's up. We will be back. We stayed here this past February and had the most wonderful and relaxing time. Hacienda is the perfect combination of a quiet hideaway with secluded, private beaches and a lively surfer town just a short walk away. We spent most days with a home cooked, authentic breakfast made by Terry - followed by some quiet pool time. We would then venture off to one of the many private beaches within a 10-15 min walk from the property. The beaches are pristine and there were barely ever anybody there, perfect for relaxing! During nights we would walk into town (35-45 min walk) which included awesome trails through the jungle, much of which is well maintained and safe. We'd then enjoy a night out in the hustle and bustle of Sayulita, great food and culture! We would 100% come back to the Hacienda, it was such a special place with many furry companions and the most gracious of hosts. The property and rooms are clean and very well maintained, the views are insane!! Thank you Steve and Terry, we hope to see you soon! 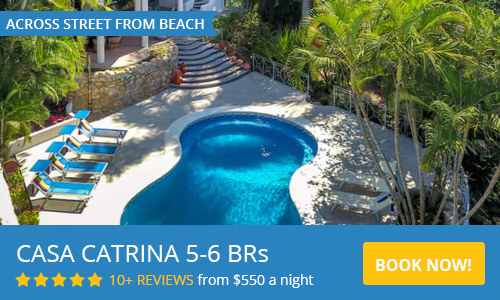 Beautiful stay close to Sayulita! My girlfriend and I stayed at the Hacienda for 10 days in February 2019. We were looking for a place close enough to Sayulita to go check out and experience the town but far enough out to also get some peace and quiet.. Steve and Terri's place was absolutely perfect! With a full kitchen at our disposal we were able to wander into town for groceries and walk back before dark, or stay in town for dinner, and to check out the night life and take a $10 cnd taxi back to the Hacienda. Terri's breakfasts are huge and absolutely delicious! Steve will let you know all the fun things to do in the area including detailed directions for hikes/walks, info on best deals for whale watching (only a few months out of the year) and excursions. Not to mention the animal therapy thrown in for free, plenty of dogs and cats to pet and play with! This place is truly special and we cannot wait to go back! My husband and I were fortunate enough to stay at Hacienda de la Costa in February, 2019 for two whole weeks. It felt like paradise. From the start of our inquiry (through sayulitalife.com), Terri’s communication was prompt, detailed and easy to follow. Let me tell you more. Hacienda de la Costa is like staying in a friends beautiful mansion in the jungle hills of Sayulita. Perfectly situated on a hill with an incredible view of the ocean, just a short walk to the beach which is, typically, secluded. Beach chairs, umbrellas, coolers, beach towels and (important) ice….all provided. We stayed in La Palma and we could hear the surf all night as we slept. The entire property is beautifully, tastefully decorated (elegant Mexican, would be my take) and spotless clean. The gardens are gorgeous and tended every day by two gardeners. The additional staff member keeps the rooms, pool area, bar and breakfast terrace spotless (and I mean, spotless). Terri and Steve are very particular about the upkeep - no broken tiles or peeling paint allowed! Truly, it is lovely. Our room, La Palma, was roomy, airy with amazing views of the ocean. We shared a kitchen with another room La Hoya and it was very well equipped (granite counters) much like an open air kitchen. There is also a washer and dryer for use - we have never had the need for using this on vacation before but did have a need with a two week stay. The terrace was a beautiful place to sit and have a drink before heading out to dinner. The bed, pillows and linens were beyond comfortable. We woke every morning rested and relaxed. A safe in the room was handy, as well - fresh towels, bottled water every day. It was pin drop quiet to sleep. The breakfasts prepared by Terri and served by Steve were incredible (other reviews attest to this) and we were never disappointed. The best part of heading down to breakfast was the amazing greeting from the animals who are very well behaved and ready for a belly rub at any moment. It made us feel even more at home with their company around the pool. The pool area is, as the rest, spotless clean and relaxing, well appointed with fluffy beach towels, comfortable lounges (and never, in the whole place, did we smell the “musty” smell that often occurs in warmer climates). There is an honour bar that is well stocked and you are welcome to bring your own, as well. We met many people who came and went during our two weeks. Some had rented a car, some not (Terri and Steve make better arrangements for this than you can on your own - trust them - they know what they are doing). We rented an SUV for the two weeks and you will need at least an SUV to venture into the roadways that take you to the Hacienda. It is well worth it if you are comfortable driving as it gives you some ability to get to the smaller areas and local restaurants that Steve recommends (do not hesitate to go to each one of his recommendations - they are fabulous). While a car is great, it is not necessary as Sayulita is a 40 minute easy walk into town and a quick, inexpensive cab ride home. We did this on several days and it was quite enjoyable, heavily canopied, safe walk. Finally, Steve and Terri. They are remarkable people. They have perfected hosting in a way that you feel attended to but not overwhelmed. You can see the expertise with which they have honed their craft of hospitality - every direction, every recommendation was perfect. And, Steve tells a damn good story or two. We were so glad to have met them on this life path. And, we were the envy of everyone who came and went during our two week stay - very jealous we got to have such a long, luxurious time at Hacienda de la Costa. Every guest commented on how blown away they were at this little piece of paradise. We will return, without a doubt. Hacienda de la Costa was stunning inside and out! From the welcome margarita to the farewell taxi, everything was pure, casual luxury! The hosts were awesome as were the breakfasts. The rooms are beautiful and the grounds are stunning The rescue pets were a bonus. This is a top notch property all around! We recently stayed at Hacienda de La Costa for a mid-Winter trip just for the two of us. I can’t wait to get back! The location is perfect for laid back days by the pool or secluded beach (we were the only ones there) or busy days in and around town. Sayulita is a fun little town with great food & beverage options and a variety of beaches and water sports. Our hosts were knowledgeable of the area and booked a couple of great day trips with local operations that we would have never discovered on our own. Our accommodations were first class in every regard. Thanks to Terri & Steve for a great stay. Magical get-away in the quiet spaces just outside Sayulita. This is our second ten day stay at HdlC - and we'll be back! Located just outside Sayulita, on a beautiful, quiet hillside just above (and looking over) the ocean, the hacienda is a perfect getaway spot. Terri and Steve and outstanding hosts - thoughtful, caring and interested in your having a perfect vacation, starting with Terri's creative home-cooked breakfasts, a luxurious pool, rooms with all necessary amenities, great views, and a nearby flawless (and almost unused) beach. To say nothing of the nearby towns of Sayulita, San Pancho, Punta Mita (great whale watching trip), and Litibu's excellent restaurant on the beach (Steve's recommend, simply great). Cannot recommend more highly! Relax and enjoy the sunset with a margarita! We are so happy we found Hacienda De La Costa and decided to spend our week there. The beautiful grounds, rooms, bathrooms, and kitchens are so well maintained - everything is in top shape. Beds are comfortable!! A beautiful beach is a 10 min walk, and you’ll be the only ones there! They have towels, chairs, umbrellas, ice chest, boogie boards - everything you need for a beach day. Sunsets are gorgeous from the beach and from the pool, there is a great ocean view from the patios. Steve and Terri are great hosts, helpful with recommendations, arranging a cab to town or a boat adventure, and Terri’s breakfasts are sooo delicious. We were happy to be far enough from sayulita to relax out of the tourist flow when we wanted, but close enough to enjoy this fun little Mexican town. This boutique hotel is truly amazing in every way. Steve and Terri are outstanding hosts and make you feel like old friends. The rooms are exceptionally clean, beautiful and extremely comfortable. Breakfasts are served poolside and will absolutely be a highlight of your trip. Terri easily accommodated my many food allergies and served up amazing breakfasts to start the day. We loved everything about our stay. Our only complaint is that we didn’t stay longer! We will absolutely be back! Only a small deposit equal to the nightly rate is due at the time of booking. All major credit cards can be processed via PayPal, it isn't necessary to have a PayPal account. Please inquire for further details. Hacienda de la Costa is open for guests November1 - May 31. Adults only B&B, daily poolside breakfast included. Starting at $160 USD per night, single or double occupancy, breakfast included. 20% surcharge for the holiday weeks of Christmas and New Years. My husband and I left the frozen north in the late 90's, a Canadian and an American living in our Mexican paradise. We've worn many hats over the years but they were all just stepping stones to bring us here. Providing you with the ideal atmosphere for your hard earned vacation is our goal, it's a responsibility that we take seriously. On that note, I should mention that we have a habit of rescuing dogs in dire need of a loving home so please be aware that there arerescue dogs on the property. They’re an independent group and we do our best to limit guest contact but I want to make sure you're not surprised by their existence here.